CULTIVATE FILM ART: MYSTERIOUS SKIN, CACHE AND LIZARD IN A WOMAN'S SKIN. MYSTERIOUS SKIN, CACHE AND LIZARD IN A WOMAN'S SKIN. We are back this Sunday with two atmospheric and involving films which both ask you to suspend your disbelief, so as the poster asks leave your brain at the door. First up is MYSTERIOUS SKIN Gregg Araki's surreal coming of age film in which two boys searching for answers head for New York to exercise their collective demons from the past and realize their future happiness. 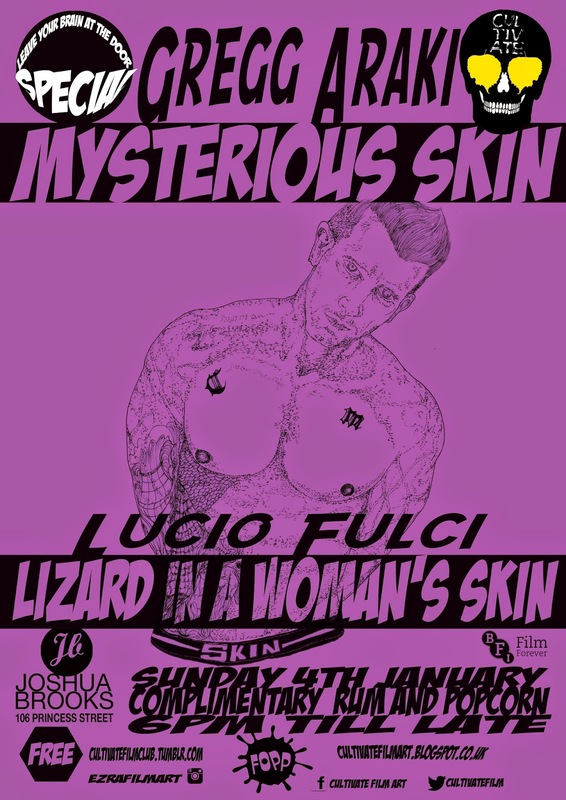 Next up is LIZARD IN A WOMAN'S SKIN this rare 'Giallo' Italian horror classic by the godfather of Italian horror and the man who gave us ZOMBIE FLESH EATERS Lucio Fulci's flamboyant, darkly comic and visually immersive and atmospheric Giallo masterpiece LIZARD IN A WOMAN'S SKIN, and no surprise it was banned in the UK. We will also have a special screening of Manchester based filmmaker TONY BOFFEY'S short film CACHE a surreal cinematic experience a star is born.